May is Motorcycle Safety Awareness Month and with warmer weather on the horizon, it’s an important reminder to everyone on the road – riders and drivers alike – to be aware of their surroundings, and to drive safely and cautiously not just this month, but all year long. There are fewer motorcyclists on the road than other vehicles so drivers aren’t necessarily always looking out for riders, even though they should be. It is up to you, as a rider, to make sure you are seen and that in the unfortunate event of a collision, you are wearing the right gear to keep yourself protected. 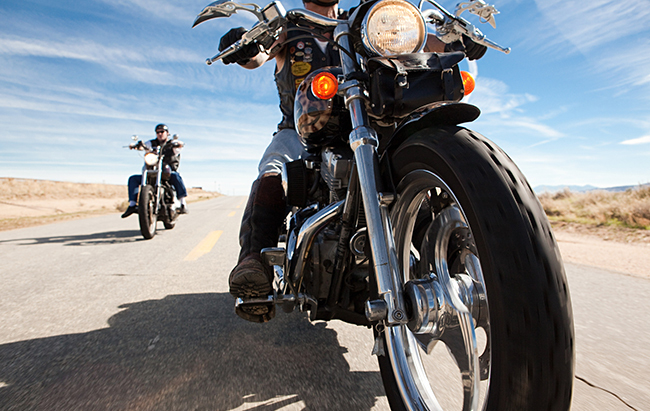 Below are a few tips to keep you safe during Motorcycle Safety Awareness Month and beyond. The duration of your ride shouldn’t determine what gear you decide to wear for the day. Your arms and legs should be completely covered not only to protect in the event of a crash, but also to prevent dehydration. Brightly colored clothing and accessories with reflective technology will allow you to be seen to other drivers on the road. On average, only 64% of riders used a DOT approved helmet. If your helmet doesn’t include a face shield, it is important to wear goggles, not glasses that could fall off during your ride. Part of riding is planning ahead. You can have all of the correct safety gear on, but staying on top of your bike’s maintenance is essential to preventing a crash. While you and everyone around you may be alert, and abiding by the laws of the road, something going wrong mechanically can spell disaster. Before every ride you should perform a motorcycle safety inspection – checking your tires, lights, fluid levels, and for possible leaks. If you plan on carrying cargo, it should be balanced and secured before your ride. Training courses aren’t just for new riders. Classes come in a variety of riding levels, so whether you’ve been riding for 10 months or 10 years, staying up to date on proper motorcycle safety and maneuvers will enhance your skills and keep you alert. Taking a motorcycle training course allows you to ride with confidence. Motorcycle Safety Awareness Month is not only about riders taking safety precautions, but is also meant to remind other drivers to be aware of motorcyclists. Motorcycles are smaller, but should be treated like another car on the road. Drivers should follow motorcycles at a safe distance and allow them an entire lane to use. When making turns or changing lanes, drivers should check their rearview mirrors, and their blind spots.